“Goonies” actor Corey Feldman said on Twitter that he was stabbed and hospitalized on Tuesday night in Los Angeles. Feldman wrote that he believed the attack was “connected” to “mounting threats” he said he has received on social media, ostensibly in connection to his efforts in exposing Hollywood pedophilia. 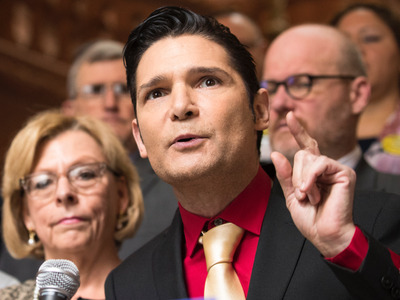 “Goonies” actor Corey Feldman was stabbed and hospitalized Tuesday night in Los Angeles, the actor wrote on Twitter. Feldman went on to write that he believed the attack was “connected” to “mounting threats” he said he has received on social media. Feldman has been talking to the media about his intention to expose Hollywood pedophiles since last year, when he announced he was raising money to make a documentary on the producers he alleged abused him as a child. He said in a video announcing the crowdfunding effort for the documentary in October that he felt had put his life in danger by doing so. In November, the LAPD launched and later dropped an investigation into Feldman’s allegations of sexual abuse from his childhood, saying that the alleged incident was “out of statute,” according to California law.